When summer began, I mustered the will power to make it home with enough fresh strawberries to make these Strawberry Coconut Waffles. I didn’t think that I could do it again, but lo and behold—I made it home from a recent farmer’s market with just enough blueberries and apricots to whip up these outrageously delicious pancakes. When you have gorgeous, perfectly ripe fruit, you don’t need to embellish much. These pancakes are proof. 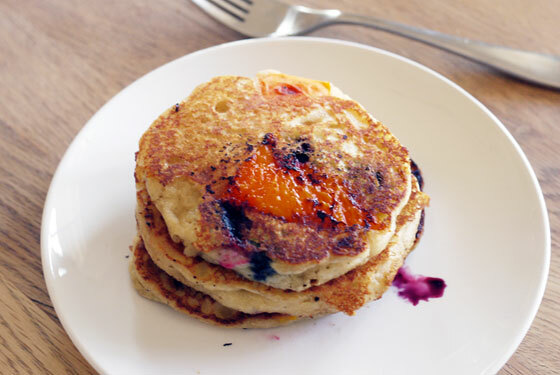 Make your favorite pancake batter, fold in blueberries, and then dot the cooking pancakes with apricots before you flip them to cook the second side. I usually cannot help but to add a little more of this and a dash of that, but I withheld this time and it paid off. These are perfect plain. The blueberries pop and mingle with the barely tart apricots and sweet maple syrup. If you want to add a dash of flavor, though, try a pinch of cinnamon or cardamom—both will work well with the fresh fruit. 1. Fold blueberries into pancake mix. Ladle pancake mix onto a hot, well buttered pan or griddle. Cook one side, as directed. Dot batter with pieces of apricot and flip. Cook second side, as directed, until golden brown on each side and cooked through. Serve warm!